Ronaldo, 32, is the overwhelming favourite to win the award, having led Real Madrid to the La Liga title and a third Champions League success in four years last season. He won last year’s award after winning the Champions League with Madrid and the European Championship with Portugal. Ronaldo previously won the FIFA World Player of the Year award in 2008 and is a four-time winner of the Ballon d’Or. Messi, 30, scored 54 goals last season as Barcelona won the Copa del Rey and Spanish Super Cup. The Argentina great, a record five-time winner of the Ballon d’Or, has made a superb start to the current campaign, scoring 12 goals in his first eight appearances in all competitions. Ronaldo won the inaugural Best FIFA Men’s Player Award last year after a six-year merger between the FIFA honour and the Ballon d’Or. The winner of the 2017 award will be announced during a ceremony at the London Palladium on October 23. The voting for the award, equally weighted between national team captains, national team coaches, media and fans, closed earlier this month. 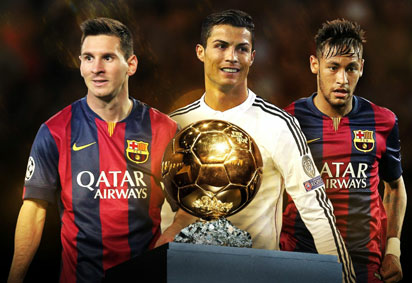 0 Response to "Neymar, Ronaldo, Messi on FIFA best player shortlist"